Antennas are probably the most important component in your FPV system. Even if you are new to FPV flying, you have probably learnt or heard about replacing the 'rubber duck' type dipole antennas which come as standard with most FPV gear to a circular polarised (CP) omnidirectional antenna, but which one should you buy? With so many different antennas on the market choosing between them can be a little confusing. Good job then you have stumbled across this antenna. Currently it’s our favourite antenna, the reason being it out performs antennas more than double its price and we can’t fault its quality. As with all good quality CP antennas, it will increase the range and clarity of your video signal. It will also help to reject 'multipath interference', a common problem with standard dipole stock antennas. The antenna is made by Skyzone but it’s the same as the popular Aomway branded exposed antenna. 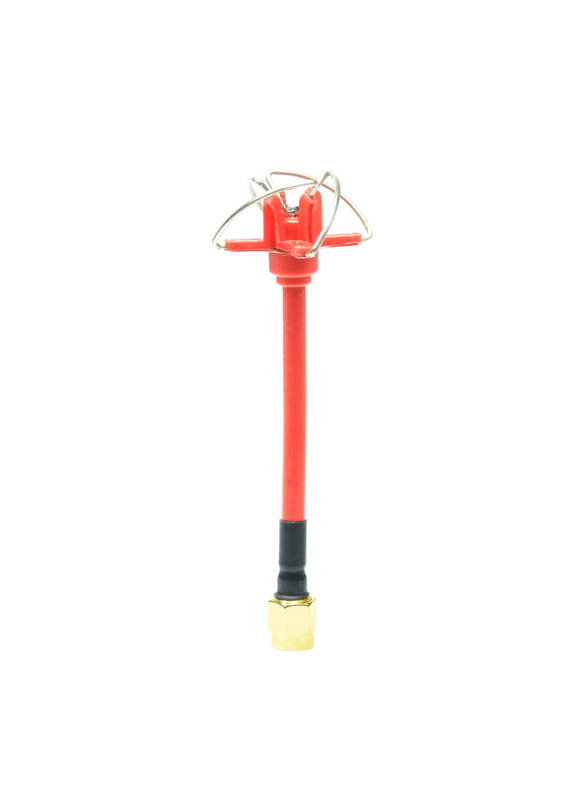 It’s a 4-Leaf Clover type antenna that can be used for both your FPV transmitter and receiver. The antenna is suited to lots of FPV setups, but in particular it has been designed with the FPV drone racer in mind. The antenna combines a small form factor, low weight and high durability with top-notch performance for the ultimate competitive advantage. Although the antenna is ‘exposed’, it’s a pretty tough little thing and will survive a lot of punishment. Each antenna has extra reinforcement around the base of the clover leaf assembly making it pretty resistant to damage and its stem is flexible, so you can simply bend it back to shape after a crash. We sell both SMA and RP-SMA versions. Note that the antenna is right handed, so not compatible with left handed antennas. Flexible stem - easily bends back to shape after a crash.